The National Environmental Policy Act (NEPA) is a law that requires land management agencies study the environmental impact of decisions they make, including for things like new trails, new roads, or new extractive activity. You might have heard of NEPA because it is the law that requires the creation of environmental assessments (EA’s) and environmental impact statements (EIS’s), and comment periods on NEPA documents are often important avenues for public participation in agency decisions. The Forest Service is considering some changes in how it implements NEPA. NEPA is sometimes a double-edged sword for recreation. It’s important because it requires agencies to take a hard look at the environmental effects of their actions and provides critical opportunities for public participations; but NEPA is time-consuming and costly so it can also be a roadblock to things that outdoor recreationists want, like building new trails. 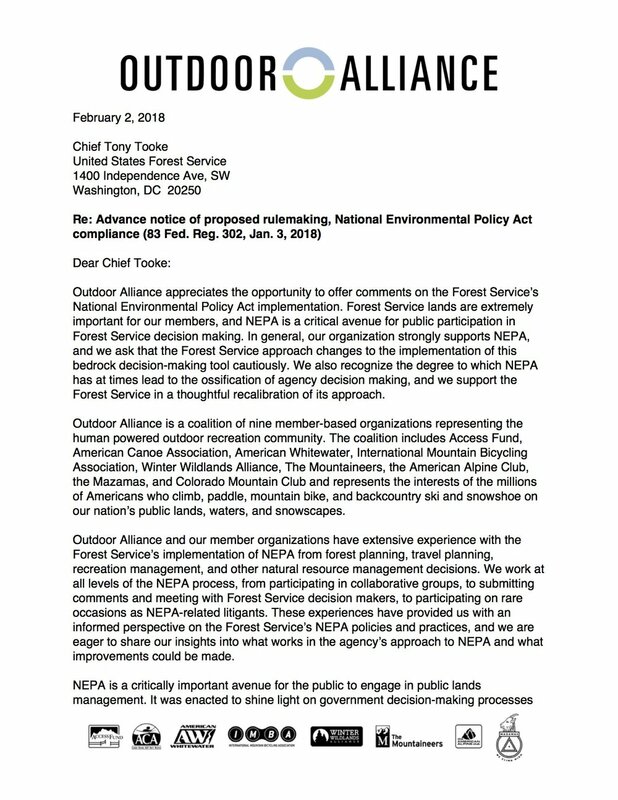 Last week Outdoor Alliance submitted comments to the Forest Service about how the agency is implementing NEPA and changes it might make as it looks for ways to be more efficient in responding to the law’s requirements. We recognize that NEPA can have an administrative burden for Forest Service staff, and that environmental analysis should be proportionate to the activity the agency is analyzing. We also asked the Forest Service to protect NEPA and the public process, and suggested ways that the agency could incorporate outdoor recreation into ongoing decisions about National Forests. You can read our full comment letter by clicking here or at right.